Start Downtown Hilo Walking Tour: Park your car anywhere you can find parking. Since this is a loop it doesn’t matter where you start. If you want to start at the statue of Kamehameha, turn on Pauahi Steet, toward statue, at the Chevron station. Parking is down the road a bit. 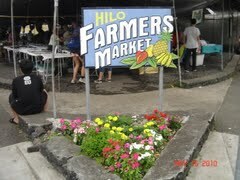 Front sign of Hilo Farmer’s Market on King Kamehameha Street. King Kamehameha was born about 1736 (estimated as Hawaiians had no written language) and took over the Island of Hawaii in 1790. In 1795 he ventured north with 900 boats and took over the lightly defended island of Maui and Molokai. The battles for Oahu were more difficult and but now entertaining to read. 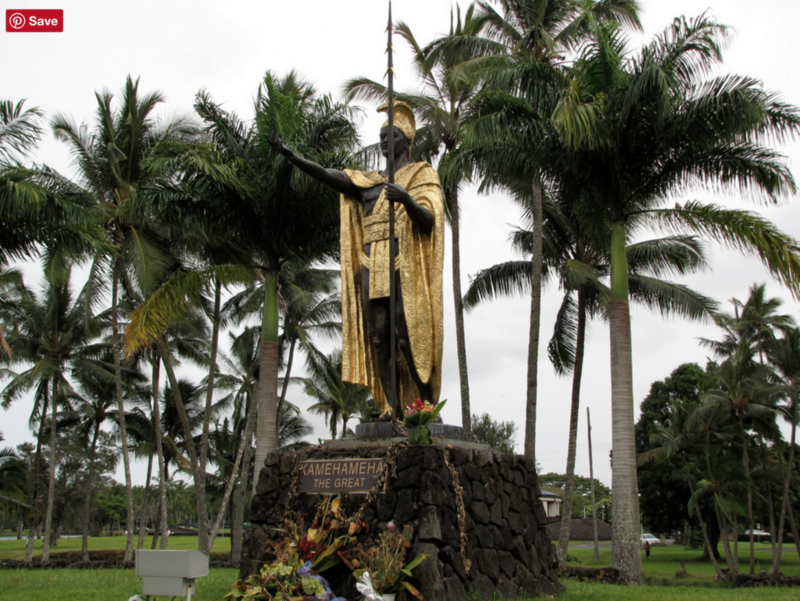 The final and most northern island of Kaua’I was always friendly to Kamehameha and voluntarily agreed to his kingship. The King’s prominence is due to his leadership ability in establishing governments, trade, fair laws and unifying Hawaii for the benefit of Hawaiians. The statue was built in 1963 in Italy and was paid for and intended for a resort in Kaua’i. The locals protested and it stayed in storage until 1997 when it was donated to the Island of Hawaii. It is considered a poor representation of what he probably looked like. After the King Kamehameha statue walk back to Pauahi Street and across the creek away from the ocean. You should see the flame from the King Kamehameha statue. There are 50 palm trees planted around the memorial for the 50 Big Island lives lost in Vietnam. The names of the fallen soldiers and shown on the plaques. I find it interesting that the flame must be from propane tank as Hawaii has no gas except trucked in propane. Wa Front of Hilo Farmer’s Market on King Kamehameha Street. 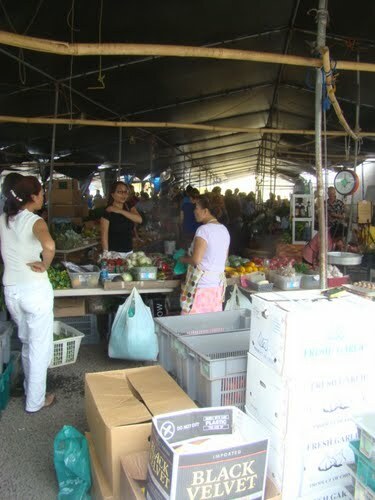 Hilo Farmer’s market on a busy Wednesday or Saturday. Walk back to King Kamehameha Ave. and go North toward the main downtown buildings. On the corner of King Kamahemahe Ave. and Mamo Street. You can’t miss it as you will see the plastic sheeting. Don’t expect more than a farmer’s market, but it is cute and a great way to buy all your fruit and vegetables from locals. On Wednesdays and Saturdays craft vendors fill the south side of the street. Buy fruits and vegetables that you have never had before. Some suggestions are dragon fruit, Lychee, Rambutan, Surinam Cherry and Rollinia. Hilo Farmer’s Market on Wednesdays and Saturdays. Other days just fruit and vegetables. 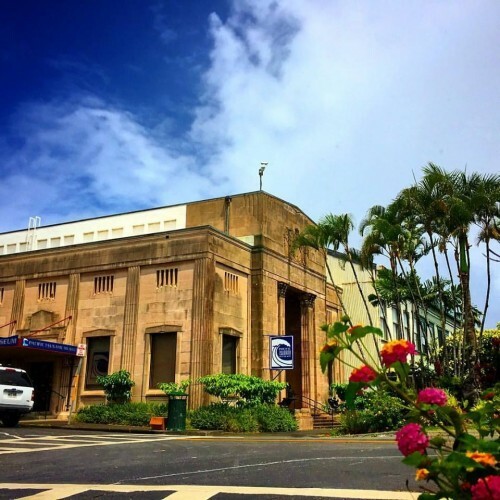 Live entertainment and movies in Downtown Hilo, Hawaii at the Palace theater. Check website for calendar. Between the Farmers Market on Mamo Street and the Palace Theatre on Haili Street and many eclectic local stores in historic buildings. Enjoy the walk along these classic buildings and stores on your way to Haili Street and the Palace Theatre. 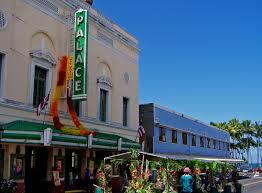 The Palace theater was built in 1925, during the roaring 20s when movie palaces were just becoming popular. It was built by Adam Baker, a nephew of one of the last Royal Governors. In 1930 it was sold to Consolidated Amusements Ltd., which showed first rate movies. Keep in mind that “Talkies” only started with the Jazz Singer in 1927. The pipe organ at this theater was for live performances during silent films. The Palace was the largest theater outside of Honolulu. Nothing like it outside of the capital city. It is built using 14 redwood pillars, imported from the Pacific Northwest. The theater closed in 1984 and was used for movie storage until ownership was transferred in 1990 to a group of citizens. It was re-opened in 1999 and is currently operated by a non profit group that has made tremendous progress in upgrading the building. Currently, solar panels and air conditioning are being funded to allow current standards of comfort for performances. Please visit their website at www.hilopalace.com for the schedule of movies, performances and special events. It is a beautiful building and great fun. Continue down King Kamehameha going North, going past more eclectic shops. Only one block north is Kalakaua Street. On the corner is the Pacific Tsunami Museum. The building was built in 1930 by C.W. Dickey, the most prominent architect in Hawaii. 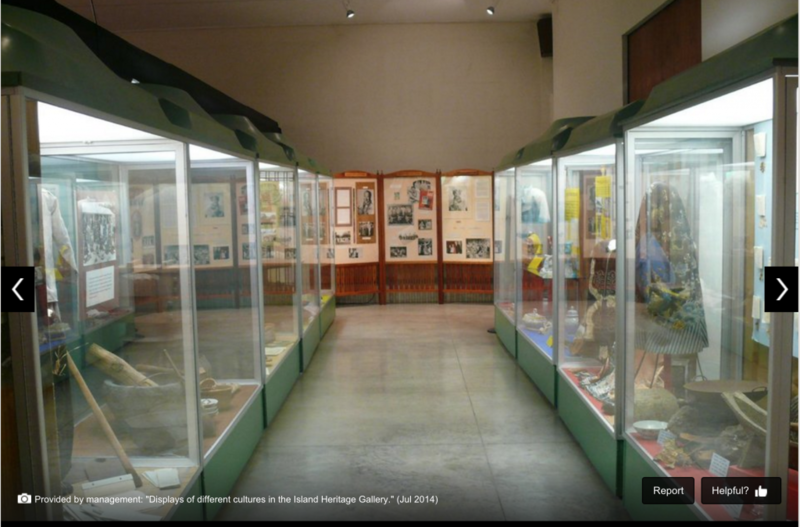 It was a First Hawaiian Bank branch until the bank donated the property for purposes of this museum in 1997. 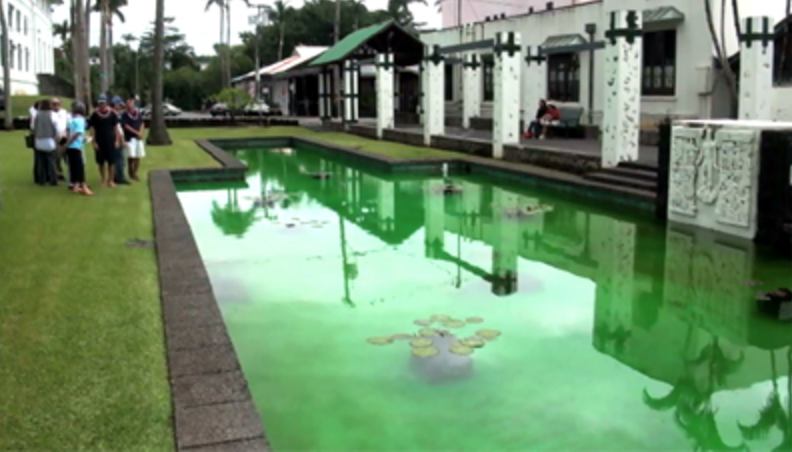 Hilo has had two devastating tsunamis. One in 1946 and another in 1960. The purpose of this museum is to show the pictures and tell the stories about these tsunamis. They have changed to landscape of the city as many bay areas were not rebuilt and are now parks as they are too vulnerable to a future event. 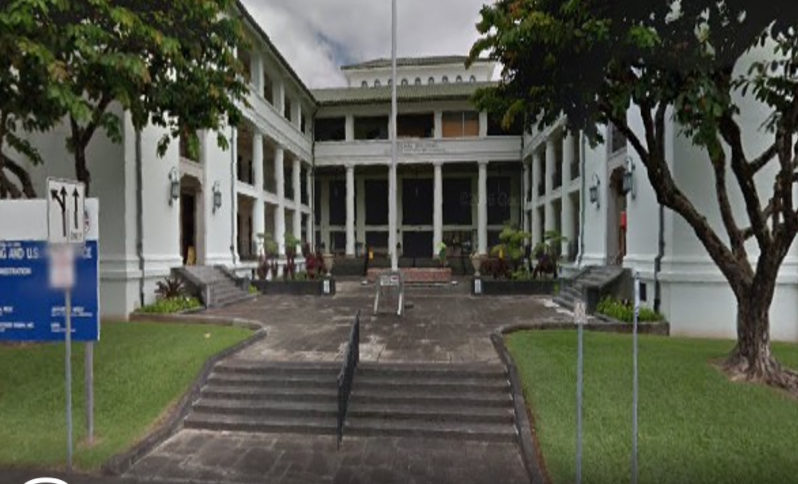 The building is nice, but unless you have a great interest in the tsunami history, the museum isn’t more than a collection of pictures and short clips. Continue one short block north to Waianuenue Ave. On the corner is the new location for this center. It is free and worth just a brief visit. 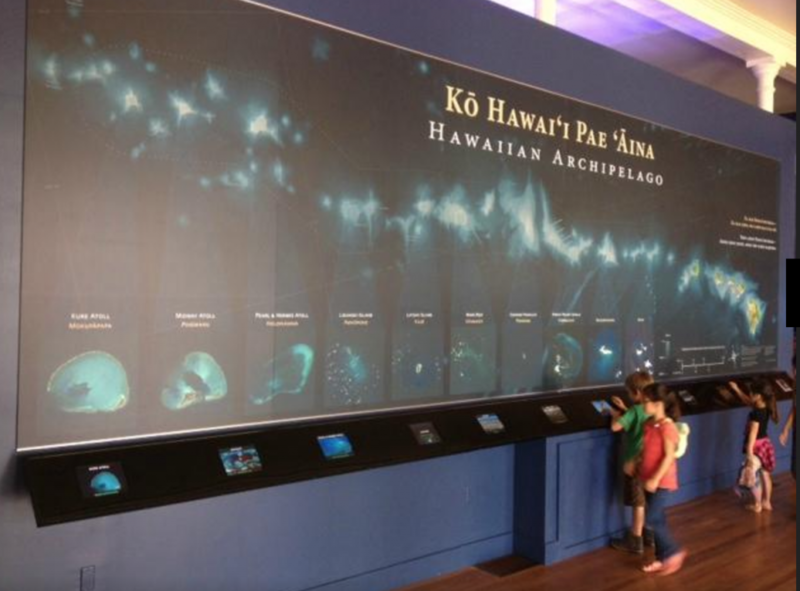 The center is dedicated to the Papahanaumokuakea Marine National Monument. This is a huge sea area north of Kauai to Midway. 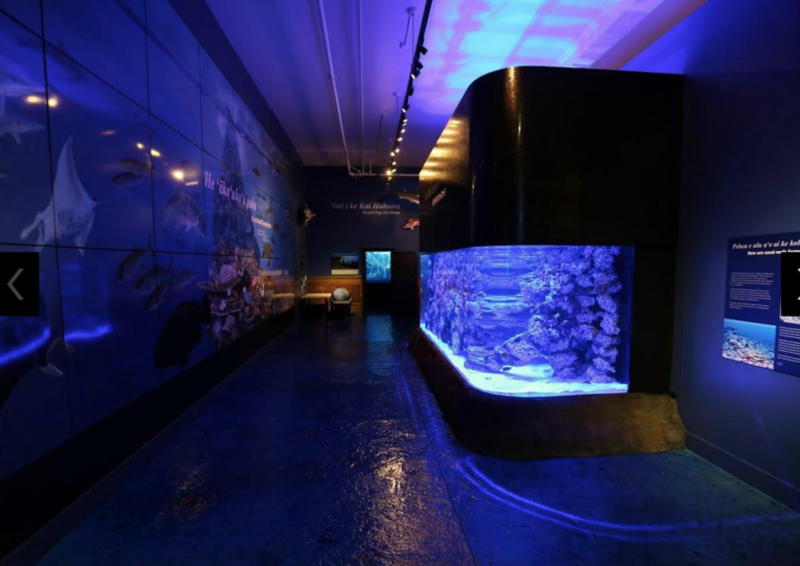 It has a nice 3,500 gallon aquarium, pictured here, and other facts about the sea area. It gives one an appreciation for the huge marine diversity that exists and how little we know about many parts of our marine world. 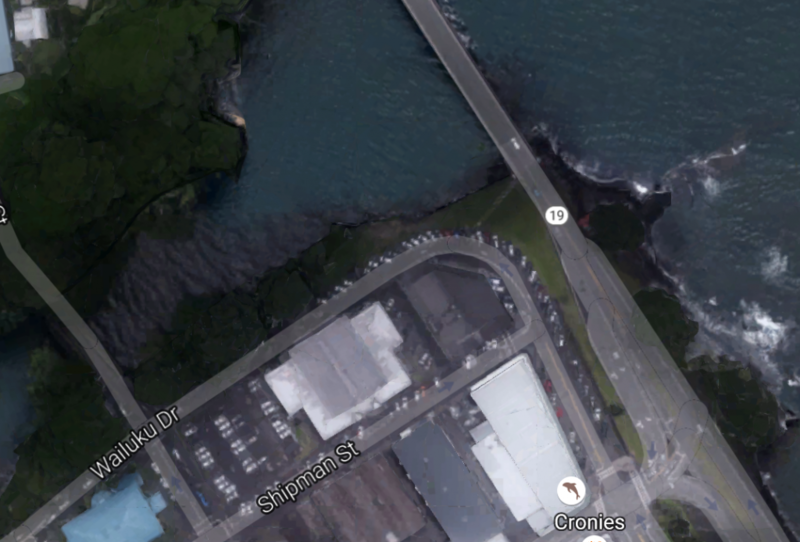 Since you are just 50 yards away from the end of downtown Hilo and the beautiful Wailuku River, just continue north and across Kamehameha Avenue to the mouth of the river. This is the same river that gives us two Wailuku state parks, Boiling Pots and Rainbow falls, just a few miles up the street. If you haven’t checked out these parks, do that after this walking tour. Many of the best places to see and to are free! Head back to Waianuenue Ave. and head a couple blocks into town. After passing Keawe Street you will come to the Hilo Federal Building. After the annexation of the “Territory of Hawaii” in 1898, the United States decided it needed a federal building and post office for Hawaii’s second largest city (it is STILL Hawaii’s second largest city). The original building was built during 1915 to 1917 by Henry Whitfield, Andrew Carnegie’s brother in law. The style is Mediterranian neoclassical with certain modern touches. Unheard of at the time, it has a full basement with raised first floor. To let in more natural light, it has a band of windows above the courtroom. It is one of the first building to use permanent materials/reinforced concrete. The large columns support the walkways, which allow for open windows and air circulation to the offices behind. From 1936 to 1938 the side buildings were built. In 1977 the Post Office moved out and in 1978 so did the courts. Simply turn to the opposite side of the street from the federal building for this park. It is named after King David Kalakaua, who ruled the Island of Hawaii from 1874 to 1891. This king is known as the Merrie Monarch king as he brought song and dance (hula) back to popularity. Each year in March/April is the world famous Merrie Monarch hula contest, located in Hilo. The centerpiece of the memorial is the white marbled monument shown on the right hand side of this picture. 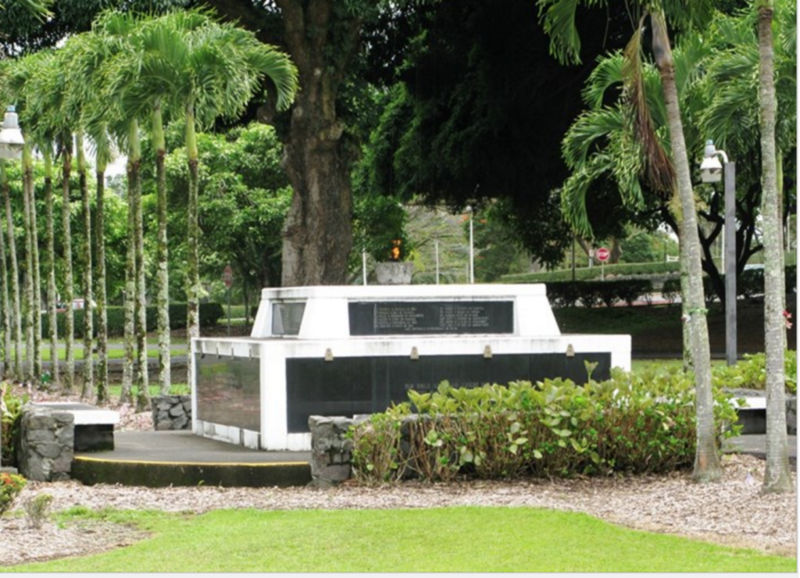 On the top are 157 names of Hawaii county residents that gave their lives in World War 2. It was conceived in 1943 and finished in 1948. Later, a plaque was added commemorating the Korean was veterans and later still a second plaque was added commemorating Vietnam war veterans. Simply walk through Kalakaua Park from Waianuenue Ave. to Kalakaua Ave. on the other side. Across the street is this historic building. The building was built in 1932 using reinforced concrete with wood interior elements. It was home to the district court and the police department. However, the courts moved out in 1969 and the police department moved out in 1975. 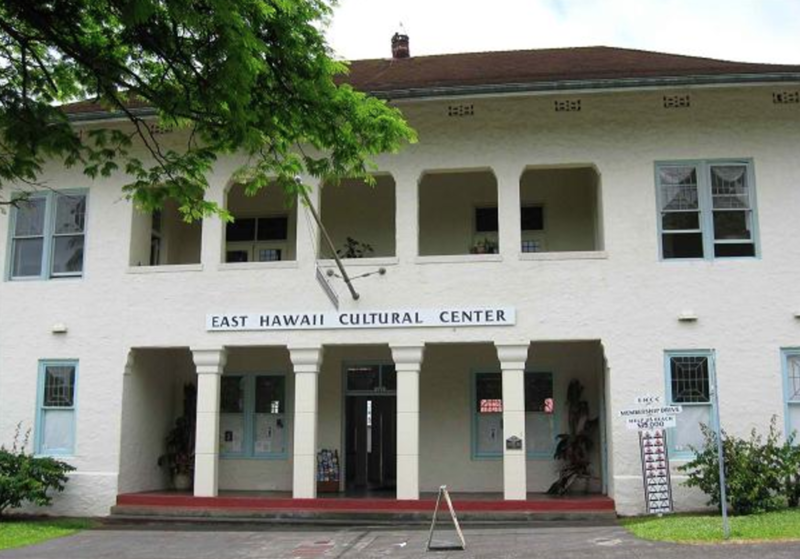 It was scheduled for demolition when the East Hawaii Cultural Council started leasing it for local events. The building was entered into the National and State Register for Historic Places in 1979. 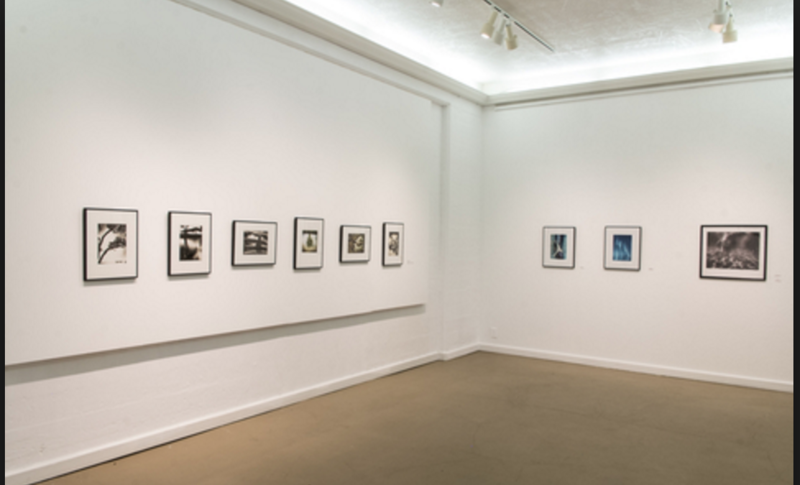 Today it is an art gallery and hosts local events. Art rotates so take a look and see if it is open. It is free with a suggested $5 donation. At this point you can decide to walk and get your car or walk back south to Haili Street and up two blocks. 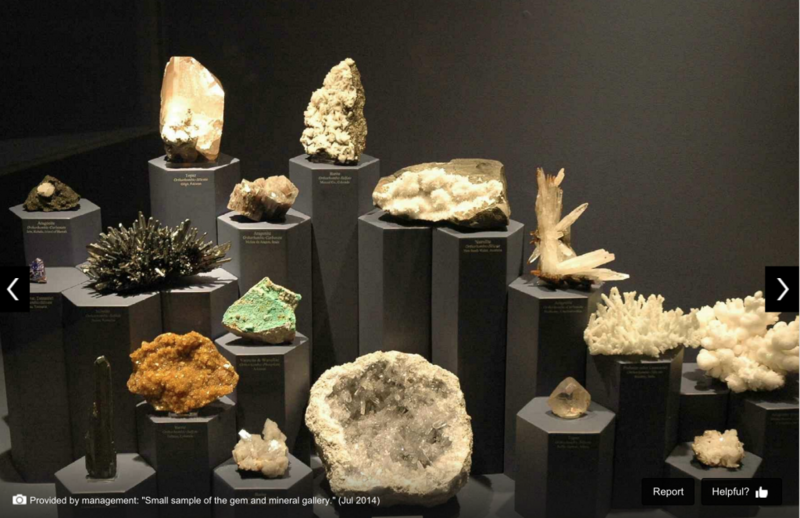 This museum consists of two parts. One is the Lyman mission house (left building) and the right is an exhibit building that is well knows for its rocks and gems. This is one of my most recommended destinations. The house was built by missionaries David and Sarah Lyman after they traveled from New England in 1832. Here they raised their 7 children. They never went back and lived out their lives here. Close by they founded a boarding school. They hosted Hawaiian royalty and other well knows guests such as Mark Twain. The house is the oldest standing wood structure on this Island and one of the oldest in the state. Here you can see how one lived so far back in time – without electricity or water. The cost is $10 and you get a guided tour. Hours are from 10:00 to 4:30, but tours are only from 11:00 to 2:00.